Taxpayer funded bodies paid up to £1,200 per head for senior staff and their private guests to attend an exclusive dinner with former US President, Barack Obama. The Ferret has also established that the bash was attended by no fewer than five senior Scottish Government ministers, some of whom were funded to attend by private firms. Tax funded organisations attending the event included the Scottish Environment Protection Agency, which sent six members of staff and four unnamed guests at a cost of £12,000 and two Scottish universities. The First Minister Nicola Sturgeon and the Deputy First Minister John Swinney attended the black tie event as guests of Sir Tom Hunter, whose charitable foundation organised it. Charities to benefit from the money raised include UNICEF, Maggie’s Centres, the Beatson Clinic, Clic Sargent and CHAS. But Derek MacKay, Secretary for Finance and the Constitution, and Michael Russell, Minister for UK Negotiations on Scotland’s Place in Europe, were both there as guests of Marie Macklin CBE. Once said to be a public admirer of Donald Trump, Macklin’s private wealth is derived from the family property and investment firm, Klin Group. Klin Group is worth £7.5m according to the most recent accounts filed at Companies House. It is said to have commercial interests throughout the greater Glasgow city region and Ayrshire areas. Macklin sits on the Glasgow City Deal Regional Economic Leadership Board, a group that plays a “consultative” role in overseeing the use of £1.3bn public investment in the area. Macklin also has the opportunity to inform Scottish government economic policy in another way. She sits with Derek Mackay, on the SNP‘s Growth Commission – a body that reports direct to the First Minister. Meanwhile, drinks giant Diageo covered the £500 ticket price for Cabinet Secretary for Culture, Tourism and External Affairs, Fiona Hyslop. In 2016 Diageo gifted the 23 hectare site of its former Kilmarnock bottling plant, along with £2m to the “Halo Project.” This pledge was matched with a further £2m from East Ayrshire Council. Backers of the project, led by private firm Halo Kilmarnock Ltd, hope to secure a further £10m from the Scottish Government to take the regeneration project forwards. Additionally, they are courting a number of public sector funded bodies to support the project including the University of the West of Scotland, and the Scottish Business Resilience Centre . Marie Macklin is a Director of Halo Kilmarnock Ltd. Drew Macklin, Marie’s husband, controls more than 75 per cent of the voting rights and the shares of the company set-up to develop the site, according to documents filed at Companies House. Diageo is also a member of the Scottish Whisky Association. It has successfully delayed Scottish Government plans to introduce minimum unit pricing of alcohol by mounting a legal challenge to laws originally passed at Holyrood in 2012. The Scottish Government has confirmed that other civil servants attended the Barack Obama event, but has so far declined to say which ones, and it has not named the organisations that funded their attendance. A Scottish Government spokesperson said: “Both the First Minister and all other Ministers that attended the Hunter Foundation Charity event were invited as guests, and therefore no costs were associated with their attendance. Other firms to buy tables at the event include a lobby group with close ties to the SNP, Charlotte Street Partners, and PA Consulting, a company that has undertaken work setting up the Scottish Government’s social security system. Scottish architects, The Kettle Collective, funded a table at the event. The firm is working on designs for a new bridge across the Clyde that will be funded by the Glasgow City Deal cash. Among the guests at the Kettle Collective table was Frank Ross, the Lord Provost of the City of Edinburgh Council. But despite austerity squeezed public sector budgets, a number of tax-payer funded bodies also paid for their staff and unnamed guests to attend the event directly. The Scottish Environmental Protection Agency (Sepa) forked out £12,000 for a table at the event. Taxpayers funded six unnamed Sepa staff and four guests to attend, equivalent to £1,200 per person. Sepa defended its spending by pointing out that Obama had the ability to positively influence international moves to cut climate pollution. “The event was a great development opportunity for some of our staff and key stakeholders to learn from, and be inspired by, Barack Obama’s leadership,” said the agency’s Chief Executive, Terry A’Hearn. Two universities also paid for their staff to attend. The University of Stirling sent three members of staff: Professor Malcolm MacLeod, Professor Judith Phillips and Kerry Bryson, along with seven unnamed guests. This cost the university £5,650. The University of Aberdeen said they spent £3,000 sending The Very Reverend Iain Torrance, Pro Chancellor, and Elizabeth Bowie, Director of Development & Alumni Relations to the event, and eight unnamed guests of the University’s Development Trust. The University of Aberdeen argued the dinner provided a “crucial opportunity for networking” and it was “standard practice” for universities to pay to attend these types of events. “As the funding landscape for universities changes, the role of philanthropy in UK higher education becomes ever more important,” said a university spokesperson. The Chief Executive of the City of Edinburgh Council, Andrew Kerr and his partner, as well as the Lady Provost and Laurence Rockey, the council’s Head of Strategy and Insights, attended the event as guests of the venue, the Edinburgh International Conference Centre. The council valued each ticket at £500. Although profitable in the last year, the company that operates the Edinburgh International Conference Centre is wholly owned by the City of Edinburgh Council and, according to its most recent accounts, the company owes the council £60.5m. 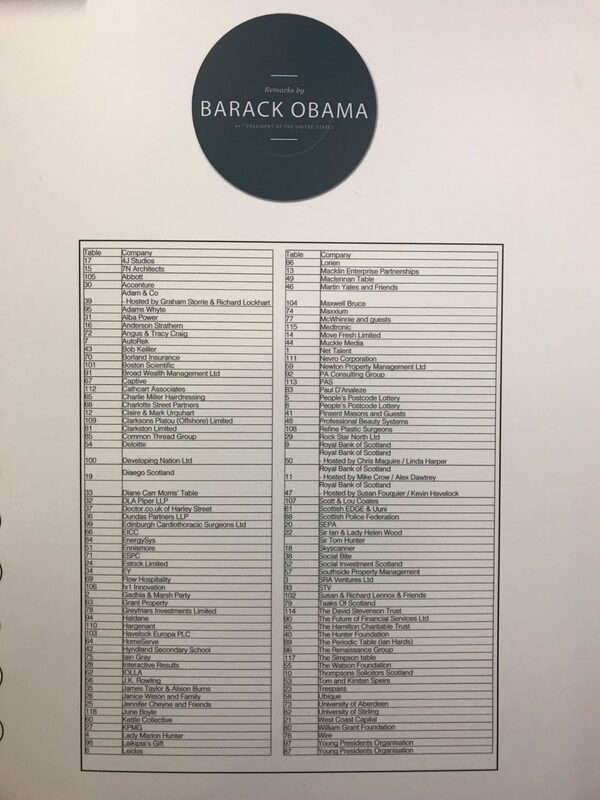 A spokesperson for the EICC said: “As host venue for the Obama event, the EICC had one table on the night with three of the guests being from City of Edinburgh Council, who are the owners of the EICC although we operate at arm’s length as a commercial venture. 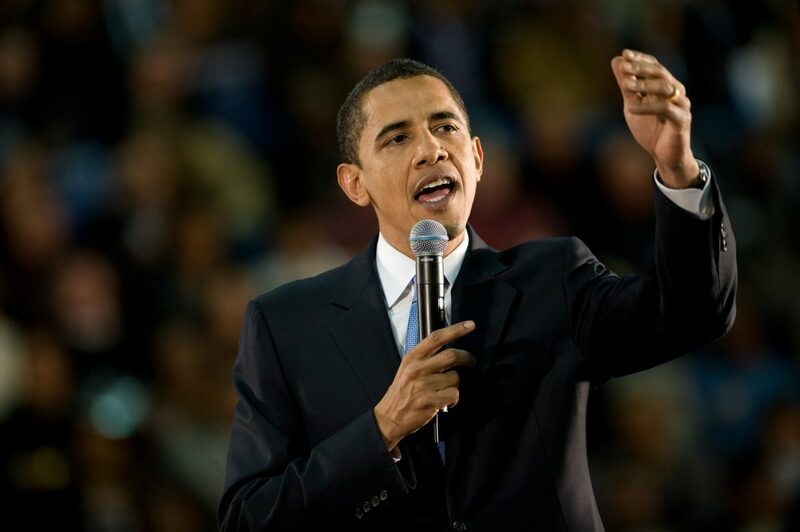 Andy Wightman, Scottish Green MSP for Lothian, said: “It’s hard to see how Scotland’s environment protection agency can justify spending £12,000 on giving six members of staff the chance to eat food in the same room as Barack Obama. Tamasin Cave, of anti-lobbying campaign group Spinwatch was also critical. “£12,000 is a lot of public money for the Scottish Environment Protection Agency to burn in one night,” she said.